► China - A Legal History is in three parts and continues in Part 2 and Part 3. See, also, Crime and Punishment in Ancient China. China has the oldest continuously operating legal system in the world. Like everywhere else, until writing was invented, law was necessarily derived from community customs and passed by generation to generation by qord of mouth, often by partable, and sometimes different to each unique geographically defined (if not confined) territory. Also, like anywhere else, some of the legal traditions of ancient China now seem quite ludicrous and founded squarely on superstition, such as deference to all things pointing South, and seeking the word of justice by an interpretation of the markings on tortoise shells. Early Chinese history relates the story of Baron Yü, circa 2,500 BC, who allegedly divided the realm into a grid with the provision that convicted criminals had to reside on the outer limits. There was widespread human sacrifice and, eventually, a prohibition against interlineal marriage. Chinese society, by custom and tradition, revolved around the family unit, with the oldest male in charge. Ancient Chinese laws reflected that: any person caught scolding his or her elder could suffer the death penalty. The ancient laws even encouraged family members to conceal the crimes of other family members. Correspondingly, the penalty for treason in later-date Chinese legal codes was death not just to the traitor, but also his whole family so the whole lineage of bad apples could be eliminated. "Legend dates the origin of Chinese law from the dawn of civilization as early as the reign of Emperor Fuxi (r. 2853-2738 B.C.). Bronze inscriptions from this period and later chronicles make direct reference to the legal concept of the preceding Xia Dynasty. "The most ancient of (Chinese) legal ideologies can be traced back about four thousand years to their origin in the first feudal dynasty in Chinese history - the Xia Dynasty (21 st-16th century B.C.). "During the Shang Dynasty (1766-1027 BC), the Chinese perfected bronze casting and created ornate cauldrons on which they carved an early form of script writing, which from time to time, referred indirectly to laws or judicial ceremonies." Unfortunately, facts about Emperor Fuxi, assuming he existed, are hard to pin down as the same sources, legend, as reflected in Chinese history, suggests that Fuxi lived for 100 years, that he had mind-control over animals and could control the weather. Later, though, there is documentary evidence of law-making in China some 4,000 years ago. Law writing was done on bamboo. Some ancient law texts have been found in burial areas; the authorities presumably wishing to impress their laws upon the spirit realm. The earliest full Chinese law code mentioned in artifacts is thought to have emanated with the Zhou or Chou Dynasty (1,027-221 BC), which governed a large part of China as a feudal system, with regional kings, lords and fiefdoms which each had their armies of peasants to work the land (Europeans only came up with their version of the feudal system thousands of years later). But China was not the static nation of today. Dynasties came and went, the states warred against each other frequently. Political intrigues and assassinations were rampant. To stoke the flames of change from within, the barbarians invaded from the North from time to time, forcibly rearranging borders and political allegiances. At one point, China had some 1,000 different political units, known as states. The earliest known Chinese legal document was a set of instructions by King Wu, circa 1,100 BC, known as Kang Goa. "Archaeologists have unearthed covenant texts dated back to 770-481 thus confirming the existence of written law during that period." As of 600 BC, some of the regions of China that had centralized rule, and codified their laws on bronze cauldrons, not unlike the Romans’ inscription of the Twelve Tables upon stone. In particular, at around this time, the state of Zheng is known to have codified criminal law and inscribed them on cauldrons and bamboo strips, of which evidence has been found (the bamboo strips pictured - some 20" long and 1/4" wide, were discovered in 1994 and carbon-dated to about 400 BC). 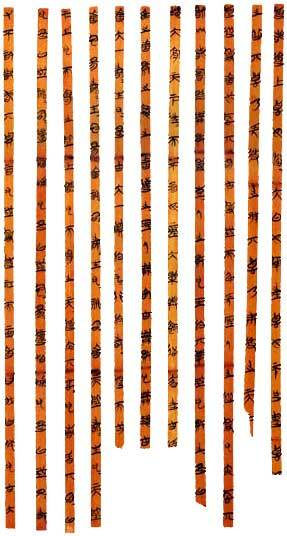 The early Chinese writers would write scripts horizontally on strips of bamboo and add strips as needed by stringing them together. In this way, the whole document would be folded or rolled up. Chinese laws intertwined spiritual elements with elements of traditional law in an early form of theocracy. Executions could only take place in those seasons of the year of decay and death in nature: Fall and Winter. The prescribed method for catching a thief involved a good measure of witchcraft. Certain hours of the day only were to be used for audiences. In the aftermath of, and in reverence to some natural calamity, Chinese rulers would grant a general amnesty, freeing all prisoners in one fell swoop. Other elements of ancient Chinese laws remind one of Hammurabi’s concept of an eye for an eye, a tooth for a tooth. The Chinese thought that the punishment had to balance with the crime in order to restore the natural balance so disturbed. Almost as soon as the Chinese developed writing and once the 4,000 years of successive of dynasties began, many emperors thought to leave their mark by reforming the law then existing to suit the needs of the time, and publishing their own legal legacy in the form of a code, usually with their name attached. In 536 BC, in the state of Cheng, a Books of Punishment (Hsing Shu or Xingshu) was published on pieces of bronze. Circumstantial evidence suggests that some of the punishments included hard labour, tattooing, cutting off of the nose, castration, feet amputation and death, the latter, usually by beheading in the nearest marketplace. "Originally, sir, I had hope in you, but now that it is all over. "Anciently, the early kings conducted their administration by deliberating on matters (as they arose). They did not put their punishments and penalties (in writing), fearing that this would create a contentiousness among the people which could not be checked. Therefore, the use the principle of social rightness to keep the people in bounds, held them together through their administrative procedures, activated for them the accepted way the behaviour, maintained good faith toward them, and presented them with benevolence. "But when the people know what the penalties are, they lose their fear of authority and acquire a contentiousness which causes them to make their appeal to the written words (of the law), on the chance that this will bring them success (in court) ... arguing to the last over the tip of an awl or knife. "Disorderly litigation will multiply and bribery will become current. Cheng will be ruined. "I have heard it said that a state which is about to perish be sure to have many government regulations." In about 450 BC, as Socrates and Buddha were expounding on philosophy in Greece and India respectively, an errant but very popular poet named Lao-Tzu proposed a solution to the constant violence which marked everyone’s political environment. Lao-Tzu philosophy was non-action; to go with the flow of things. He gently proposed that the less government, the better, and that all violence was wrong. Shuhsiang’s letter smacked of Lao-Tzu and was a harbinger of a debate still ongoing in China amongst jurists, with those that believe in strict state control – the more laws the better, called legalists, and those called moralists or, later, Confucians. In fact, the legal history of China - as well as its law today - reflect that law-making roller coaster as the governing groups vacillated between the two styles. "... written law was still a novelty (in China) and hence viewed with suspicion." ► This article on China - A Legal History is in three parts and continues in Part 2 and Part 3, the latter page including references.